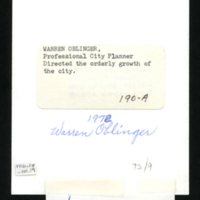 Warren Oblinger, Professional City Planner, Directed the orderly growth of the city. 1972 -- label on back of photograph. "Warren Oblinger deserved credit for the many ways in which he steered the Planning Committee, City Administrator, Mayor and Council. 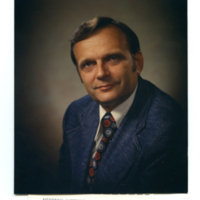 He gave advice on the placement of the I-35 Highway which was planned to bypass Hesston by one mile. At Oblinger's suggestion, city administration took action in time to influence the government to bring I-35 within one-half mile of Hesston. This action gave the city room to grow to the east and still not be isolated off the highway. Oblinger influenced the composite planning for city growth. He was was involved in the planning and placement of parks and recreational facilities" (Bandy, 72). unknown, “Warren Oblinger,” Hesston Public Library, accessed April 19, 2019, https://hesston.digitalsckls.info/item/1336.